Welcome to the 53rd issue to subscribers of Right Writing News. If you are reading this issue forwarded from someone, be sure and use the link below to get your own free subscription. Book editors and literary agents are looking for visible authors. I'm talking about authors who have an already established connection to their audience and communicate with that audience on a consistent basis. The buzzword that is commonly used in publishing is called “platform.” What is the author's platform? Many authors are chagrinned to hear this news. They thought the publisher was going to be the one to promote and market their book. These authors want to focus on storytelling and creating the best possible novel or nonfiction book. They don't want anything to do with marketing. Because these authors resist being involved in marketing, their pitches are consistently rejected and they struggle to find an editor or agentto champion their project. One of the simple yet effective ways to build your market presence is through blogging. On a consistent basis, I've been writing my blog since December 2004. The experience has been valuable in dozens of different ways and I've learned a great deal from it. Also I've increased my presence in the marketplace through blogging. 1. No focus. The word blog is short for a weblog and you start your blog with a literal use of this word. You write whatever comes into your head with no focus and no particular topic and audience in mind. In the process you crank a bunch of words into your computer. Yet are you drawing an audience? 2. No consistency. Sometimes you blog several times a day. Other times you go weeks or months without a single entry. You put information into the blog without any constant flow. And if you look at your viewing statistics, you see the results—lame. 3. Not picking a niche with passion. While this relates to focus, as a blogger, you need to select a particular niche that you will write about for a long time—with passion. Many bloggers fail to account for this element and they blog for a while then run out of steam. My blog has been going strong for years because I am passionate about the area I selected. Are you? 4. No email updates or RSS feed. Readers are different and you need to appeal to many types of readers. Some people like reading the entries on the site while others prefer to receive updates via email or their favorite blog reading tool which picks up on the RSS (really simple syndication) feed. You are missing out if you aren't using these simple resources with your blog. 5. No links to other resources. No one contains all of the information about any particular topic. People who read and love blogs like to have other resources within a blog post. You need to include links to other people's materials and resources as you write your entries. It will broaden your base and help you in countless ways. I've just listed a few of the countless mistakes that people make in setting up and maintaining their blog. They do not attract readers nor make any money from their blog and quickly lose interest. They chalk it up to a wasted experience. You can avoid these mistakes with a little forethought and consistency. I want to help you build your presence in the marketplace with a blog. Whether you are a blogger or not, I have some insights for you. On Tuesday, August 7th, I will be answering your questions in a FREE live teleseminar at www.askterrywhalin.com I encourage you to ask your questions. Hopefully your question will be one that I will answer during the 70–minute event. If you can't make the exact event, go ahead and register because it will be recorded and everyone who signs up will receive an email to the recording after the event. To encourage your blogging efforts, everyone who signs up for the event will receive a free copy of my Ebook, Bloggers Guide to Profits, Discover the Little Known Secrets to Making Money with our Blog. If you scroll down the right side of my blog, you will see that I sell this book for $9.95. During this event, I'm giving away this valuable resource to everyone who registers. Please feel free to pass this information along to others and have them come to this live event. I look forward to answering your questions on August 7th. In the last couple of weeks for the first time in eight years, I moved physical locations. I've had several job transitions during my years in Arizona but not a physical change. Our family moved to Irvine, California to be near family and also to downsize. The experience has thrown off my regular writing. While I've heard (and followed) the various writing maxims for many years such as write every day and take action every day. Over the last few weeks my efforts have been focused in some other area than my writing. It has meant I've done very limited writing and most of that writing has been limited to emails and nothing which shows up in entries about The Writing Life. From my moving experience, I rediscovered the cleansing nature of downsizing. For example, I had three bookcases in my office but in my new place, I only had room for two bookcases. Also in the moving process, I sorted through boxes of books which I was stacking in my garage. I hauled 30 boxes of books to my public library where I donated them. In the process of sorting, I made snap decisions about hundreds of books—whether to give away or keep them. To be honest, I have looked for a couple of books on my shelf and not found them (which means I gave them away). Yet overall the elimination process has been valuable because I eliminated the “stuff” clogging my bookshelf. What action can you take today to sort through some books on your shelf and donate them to a good place like the public library? To compound all of the change in my life from the physical move, I also changed jobs right in the middle of it. Each day I've been actively calling and emailing authors about their projects with Morgan James Publishing. As a publisher, we're excited to have another book on the New York Times bestseller list (the week of July 15th). Congratulations to Gordon D'Angelo and his book, Vision: Pathway to Victory. Getting on this list points out one important fact: Morgan James is selling books through the bookstores. On the writing front, what are you actively doing to be on the move? Many writers dream but never take action. They read about writing but never write. Or they try a couple of times and get rejected—and every writer gets rejected—and put their writing away. To succeed with your writing you have to be on the move and taking daily action. —get connected. As a writer, you need to know others who are writing in your area of the market. Reach out to them via email or on the telephone or face to face. Don't see them as competition but instead view them as colleagues. Reach out and help them and they will help you. I've learned a tremendous amount from other writers—in forums, in face to face interaction, in books, in blogs and much more. If you and I are not connected on some place like LinkedIn, then take the initiative and send me an invitation. LinkedIn goes to my personal email address and while my public profile says I have 500+ connections, I actually have close to 2300 connections. Here's the key—just like everyone else, I started with one connection. You can build it as well but need to be taking action on a consistent basis. —get published. I've written a great deal about how to get published in these pages. I'm talking about print magazines, online publications, newsletters and yes even books. Print magazines in general have a higher standard and are more respected than online publications. Take some time and study the details in my article on the basics of writing for magazines—then take action and write some query lettersand get published. It does not get published sitting in your computer. You have to take action to get published. —get educated. I repeatedly learn from others and a writer's conference is a great place to increase your learning about the marketplace and be on the move. August 4th I will be at the Texas Christian Writers Conference in Houston. I have a number of live events where I will be speaking this fall (use use this linkto keep up on my schedule). In recent weeks, my focus has not been on these entries—to my regret. I've recommitted to writing here on a regular basis. I'm back on the move and hope you will be as well. Years ago I heard Paul E. Little speak about how to find direction for our life. He said something that has stuck with me, “God can't steer a parked car.” Are you on the move? I recently read an article that detailed seven ways people could support their author friends. It was well-done and offered the type of specific information I'm always looking for, but honestly, it felt a little...well...self-centered. I mean, really, am I supposed to expect my friends to ask me how they can promote my book? Or, worse, am I self-absorbed enough to think that my friends are using Google to find ways they can support my book marketing? I could never send any of them a link to that article with a note saying, "Please read this and see what you can do." I'm also one of those people who would never say, "Please buy my book." But that was one of the suggestions in this article - "buy the book." Most of my friends aren't interested in my book topics, so why would they buy any of them? Your book might be different, of course, but my books are on business topics and many of my friends are social workers, teachers, and so on. In reality, while our friends think it's "cool" that we're authors, it probably doesn't even occur to most of them that they are in a position to help us get the word out. It's our responsibility to ask for that help. The challenge is in finding a way to make the request in a way that works for you - not me, not my friends, and not another author. Here are some things you will want to consider asking friends to do along with suggestions for making your request something they can act on quickly and easily. You might not be comfortable with all of these suggestions, but there might also be a way for you to get the end result with a different approach. 1. Share information about your book with the "right" people in their e-mail address books. Remember that you didn't write your book for everyone. You wrote it for a specialized audience, whether it's fiction or nonfiction. (Not everybody likes mysteries, right?) It's okay to ask your friends to share information about your book with their networks, but when doing so, make it clear that you realize that they might want to be selective about who they share the information with. Send an e-mail that describes the book, explains who will find it interesting, details how they will benefit from reading it, and includes a link to an online purchase site. Suggest that they forward that information to appropriate people. 2. Provide information about organizations that might use you as a speaker. A complementary word or two from a friend who is a member could be all you need to be the luncheon speaker at the monthly gathering of a group that's perfect for your book. 3. Look for your book at bookstores and request that stores stock it if it's not available. A lot of my friends are authors, so I do this for them at Barnes and Noble all the time. I also turn the cover face out on the shelf so it's easier to see, and when there's more than one copy, I add one to a display at the end of the shelf, too. If a friend's latest book isn't in stock, I ask the store to order it. 4. Use Twitter, Facebook, LinkedIn, and other social networks to share a link to a purchase page. Ask them to write a personal message with the link, such as "Can't wait to read my friend's new book about business etiquette" or "Nobody writes better science fiction than my friend Justin Brown - buying his latest book now!" 5. Share a review online. Give a copy of your book to friends you can trust to actually read it, asking them to write a positive review on Amazon and other retail sites. 6. Interview you on their blog when it's a good fit. This is a reasonable request only when the blog's target audience matches your book's. Otherwise, you're putting your friend in an awkward and unfair position. 7. Rate reviews on Amazon so the good ones show up first and the bad ones show up last. At the end of each review, Amazon asks, "Was this review helpful to you?" Click "yes" for the four- and five-star reviews and "no" for anything with less than three stars. The "yes" clicks will help make sure that the positive reviews stay at the top. What have you asked your friends to do to support your book, and how has that worked out for you? Please send me a note and tell me your story! Sandra Beckwith is a former national award-winning publicist who now teaches authors how to be their own book publicists. Get free tips and subscribe to her free “Build Book Buzz” e-zine at http://buildbookbuzz.com. Need help writing that essential press release for your book? If you’re like most authors, you know you need to write a press release that announces your book, but you aren’t sure how to do it. Fortunately, you finally have help. Get Your Book in the News: How to Write a Press Release That Announces Your Book (http://bit.ly/SW3izO) is the only resource that takes you through the process step-by-step. Written by my friend Sandra Beckwith, a veteran publicist and book marketing coach, the 50-page e-book helps authors, book publicists, publishers, and others learn how to create a document that contains the information journalists need and expect. The book is available as a PDF for $9 at http://bit.ly/SW3izO. For more information, contact Sandra at sb@buildbookbuzz.com. If you hold a glass partially filled with liquid, what is your perspective? Is the glass half filled or half empty? For the last six or seven years, I've been writing about publishing, I believe the glass is half full. As I look over the landscape of the publishing world, I see opportunities are everywhere. Magazine editors are actively looking every day for writers who understand their publication and write targeted articles for their readers. Editors of online publications are reading their email and looking for excellent material to use. Book editors are also actively reading their mail (and email) and continually listening to literary agents and writers as they pitch their ideas. Over the years, I've been inside some of the top literary agencies in New York City. These literary agents are looking for the next bestseller that they can champion to their editor friends. One of the keys to seizing an opportunity is looking for change. The marketplace is constantly changing. New publications start. New editors come on the scene. Long-term editors will leave their publisher and start to work as a literary agent. These changes are only a few of the many transitions in the marketplace. When you read about these changes, I encourage you to understand they are opportunities for you as a writer. Each of these professionals is actively looking for a new stable of writers. Your pitch has to be right on target but it can make a huge impact if it comes at the right time. During the last month, I've also been making some changes. After four years at one publisher and working with many authors, I recently resigned that role. I took an acquisitions editor position with Morgan James Publishing. Each day I'm actively looking for excellent book proposals which I can present to our publication board. Because Morgan James is based in New York, I've got a New York phone number and mailing address. For the last eight years, I've been living and working in Arizona. Now I live in Irvine, California. In a pattern that is familiar to many in the publishing world, I will telecommute for my acquisitions editor role. If I can help you, don't hesitate to reach out and send me your proposal. —continue to build relationships with anyone and everyone in the publishing community. You never know when a relationship may become important to you. Writers become editors. Editors become literary agents. Literary agents become editors. The fluid nature of the community means you should work each day to expand your connections. —continue to grasp opportunities large and small which keep you active in the publishing world. There are times when the phone does not ring and you receive no personal email. How do you handle those times? Do you pull into your shell and do nothing or do you increase your activity? I encourage you to write more query letters and pitch more ideas. Activity will breed activity. —take action every day to write what you want to write and continually touch the marketplace. Earlier this week I exchanged emails with a long-term friend. He has been dreaming for years about writing a book—yet never put his fingers on the keyboard and produced any writing. The days continue to pass and he has not taken action. I encouraged him to choose a small number of words that he wants to write each day and then commit to working at his writing. If you take this small action step, you will be surprised after a month or two at the accumulated writing. It does not happen without taking action. Let's return to the half filled glass. Do you see opportunity? Lots of people start online businesses - but very few will succeed. Most will quit and end up back at their day jobs. Some will go on to make a living online. And an elite few of these new business owners will go on to make a fortune. There are a lot of ways to make money online. If you want to make money online, you need to choose one of the proven methods. Then choose a goal, draw up a business plan and stick with it until you see results. The easiest people to sell to are those who are already buying niche products. That is, they're hungry for solutions. All you have to do is offer them more of the same. One note, however: Don't focus on a big market (like "dog training"). Instead, focus on a small segment of a bigger market (such as "training German shepherd dogs" or "dog training for busy people"). Even though you're focusing on a smaller group of people, you'll actually make more money because your niche members would rather buy a niche-specific product than a general product. Example: Those who own German shepherd dogs (GSDs) will choose GSD training manuals over the more general "dog training" manuals. Once you choose a niche, then you need to determine what they want. The easiest way to do that is by finding out what they're already buying... and giving them more of the same. Tip: If you're going to sell digital products, then go to the Clickbank.com and Amazon.com marketplaces to find out which products are bestsellers. You'll want to create a product on a similar topic. Your prospect list - those people who've joined your newsletter list but haven't yet purchased anything from you. Your customer list - those who've already bought from you. Your partner list. This is your list of joint venture and affiliate partners.
? You should nurture each of these lists and follow up with them regularly to build relationships and close sales. Don't count on one product to make you a fortune. Instead, create a lead-generating sales funnel that's stocked with dozens of closely related niche products. When someone buys something from you, offer to sell them a related product. It's the best way to build your business. You don't have to start from scratch when you're looking for traffic. Instead, leverage the hard word of others by using affiliate marketing, joint venture marketing, social networking, YouTube and similar sites. Some of the most responsive and profitable customers you'll encounter are those that were referred to you by their friends. That's why you should encourage and customers to refer their friends. You may even offer incentives, such as cash, discounts and freebies for those who refer other paying customers. Your prospects are everywhere, both online and offline. That's why you should contact and communicate with them using multiple channels, such as blogs, newsletters, social sites, direct mail, offline seminars and so on. If you don't know which of your products, ads, sales letters, advertising venues and marketing campaigns truly put the most money in your pocket, then you're wasting your ad dollars. Start using tools like Google Analytics immediately so you know where to focus your efforts. If you want to get your business off the ground fast, then enlist the help of trusted freelancers to help you build your business. You can outsource tasks like article writing, product creation, copywriting, posting to your blog, web design and much more. You can build your freelancing team using sites like elance.com, getafreelancer.com, rentacoder.com and guru.com. Business success isn't an accident. It's the result of a series of well-planned steps, ten of which you just discovered in this article! One of the most important marketing tools to take to conferences are business cards. From attending many conferences, I'm always surprised when an editor or agent only has a few business cards—and they quickly run out during the event. I will pull out my notebook and get their email and phone number for follow-up. Often I suspect, I'm one of the few editors who make this effort. It has repeatedly paid off from my perspective with additional opportunities and connections. If you are going to a conference or any face-to-face type of event, get some business cards. You can make your own cards with a package of blank cards at some office supply place and a simple Microsoft Word template. There is no need to be without business cards if you are taking some simple preparation steps for the conference. In preparation for my conference last weekend— and also for my other conferences this fall (see the link for my schedule), I made a new personal business card. Yes I have my Morgan James Publishing Acquisitions Editor business cards and will use them throughout the events. In this article, I'm focused on my own personal business card. Because I moved, I needed new business cards. Since I was printing new cards, it gave me the opportunity to think through my information on the card. Yes I changed my office address but what about the other elements on it? Were they the right elements for the audience (the people who will receive them)? Recently I received a new book from a new author. It included her business card. From hard earned experience, I've learned to not throw away the envelope before I look at what is inside the package. Why? The author's business card included her name, phone number and email—but not her address. The only place her mailing address appeared was on the outside package. I suspect it was an oversight on her part. The most difficult thing to proofread is something not on the page. It includes my business mailing address, my personal email, my website to purchase my latest book and my twitter name. 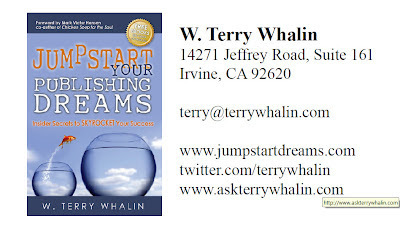 I added www.askterrywhalin.com to this card because I hold regular teleseminars with a different focus at this website. Did you notice what is missing? I did not include my phone number but the information is on the contact page of my personal website. I'm not hard to find. My target audience are writers or authors or would-be writers or would-be authors. 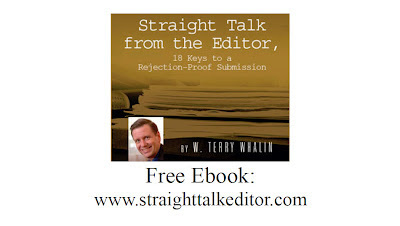 I'm giving away my free ebook, Straight Talk From the Editor, 18 Keys to a Rejection-Proof Submission. Anyone can get this free ebook, 24 hours a day at www.StraightTalkEditor.com. I purchased my cards through Epic Print Solutions. Please check out their site because they can help with any printing need at a reasonable cost. Finally, think about your own business card. Is it complete? Are you thinking through how the audience will use your card? Does it include something to help others such as a free Ebook? Are you using the card to build your list and connect with others? If not, can you take steps today to begin to put together such an action plan? I recommend you consider my Ebook, The List Building Tycoon or get the Amazon Kindle version of this Ebook. Read it and follow my advice in it. Your business card is an important market tool for your arsenal. Are you using it?